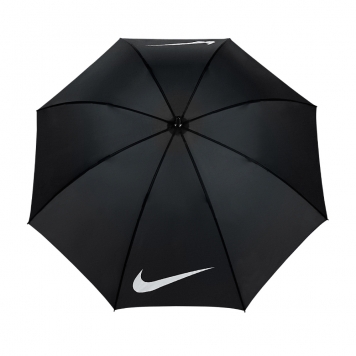 The Nike 62” VII Windproof Golf umbrella features a nylon canopy that will help prevent the umbrella turning inside out on windy days on the golf course. With its durable lightweight fibreglass shaft and flexible rib frame the Nike VII umbrella can cope with the toughest of weather conditions and protect you and your golf bag from getting soaked with its 62” coverage. Nike have used a pinch less opening mechanism for a smooth and safe opening and closing. The handle is a dual-density grip that has been designed to fit securely into your golf trolley or cart as well as be comfortable to hold for long periods of time. Lightweight design features a 100% nylon canopy, durable fiber glass shaft, and flexible FRP rib frame. Pinch less opening mechanism allows for safe and smooth opening and closing. Two-colour rubber handle with a dual- density grip is designed to fit comfortably in your hand or securely in your push cart. Swoosh Design trademark printed on front and back panels.